Today we start the adventure called third grade! I have always heard that kids grow up fast but until you are in the throws of it all you don't realize how fast. It is sometimes sad to see how fast she is growing up, but every stage brings more joy (and challenges of their own!) and it is an honor to stand beside this little girl as time marches on! Decluttering. I started in Megan's room and then went on to the office/craft/catch all room. I am ashamed to say that I took two load to Goodwill. I went through Megan's room twice. After the first go through I spoke with Megan about stuff and how too much of it becomes clutter and make it hard to keep things tidy and that if her room was stuffed she wouldn't be able to bring in anything else. I was proud of her for going through her room again and letting go of things. Now I am motivated to get the entire house lighted up! Mending. I have an overflowing basket and I am working my way through it. School. We were very close to homeschooling this year. In the end we sending Megan back to the private Christian school she has been at since preschool. School starts on Thursday. It was not an easy decision and we will need to prayerfully start considering the choice for next year. Grocery shopping. I have gotten out of the habit of my monthly grocery shopping. I need to not only get back to that to get the budget lower but also need to build up my stockpile. I am ready to get busy and get some things accomplished! After a week that took this homebody away from home far too often it has been nice to be home sweet home! After a week of cooler weather the heat and humidity has set in. That makes a load of laundry dry in no time. Spending more time had home has allowed me to do a little bit of organizing. The mess in this drawer was driving me crazy! I had to cut it down to fit the width of the drawer and then wrapped it in some paper from the dollar store. So much better! Now my things aren't sliding around every time I open and close the drawer. Some time was spent in the kitchen working on some things for the freezer. After a morning of cooking the kitchen needed a little bit of attention. I have also been out in the yard. For some reason we are having tons of branches fall this year. The band struck up a tune. Just for a few minutes before I suggested (or maybe just told them!) to make it a marching band in the back yard. It feels good to have time to make lunch. VBS lasted until noon so lunches last week were quick and not very healthy. Another project is off of the list. The final coat of paint was put on the wishing well flower container. I love being home and am enjoying home sweet home! 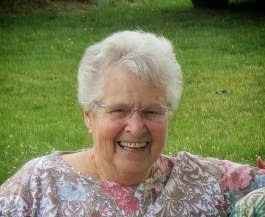 We said goodbye to our sweet 82 year old neighbor last week. I know that I have mentioned Celia several times on here. Usually for a treat or meal that we shared with her. Yesterday Chuck and I were honored and humbled to spend some time talking and praying at the bedside of our 82 year old neighbor, Celia. One of the things we talked about was that she was going to meet sweet Jesus soon. Well, this evening she entered the gates of heaven. I am saddened that I won't have the comfort of looking out the window and knowing she is there or sitting on her back porch chatting. My heart is rejoicing that she is healed, whole and sitting at the feet of Jesus! We'll miss you, Celia, but look forward to seeing you again one day. Sunday was our church picnic. Unfortunately we were unable to attend as Megan wasn't feeling well. I had already prepared my dishes to take so I sent them in with my mother-in-law. Mix peaches, pineapple (along with juice) and box of pudding until dissolved. Stir in remaining fruit and chill. Megan orders a glazed fruit dish at a restaurant we sometimes go to. She asked me if I had made this or bought it from the restaurant. :) I know I will be making this again as Megan is already asking for a different fruit combination next time. Unbelievable that my girl is eight! We celebrated with dinner at a restaurant with family and back home for some cupcakes and presents. Simple and sweet! An unplanned project also happened during the long 4th weekend. The back porch was pressured washed. We are getting a new roof on our home and back porch due to a hail storm. We had hoped to paint the back porch next year but this has moved it up a little bit. The plan is to at least have the rafters and anything that touches the roof painted before work begins. An afternoon spent at Papaw's house (Chuck's dad) meant fun on the zipline! We've had the opportunity to spend time with friends. Our friend, Rob, is a kid at heart. We love this guy! A cookout with friends allowed Megan to play with ducks. We have had lots of friends over and have been making treats to share. The weather has been great and many days have been spent in the backyard. I am a firm believer in kids having lots of time outside to run, play and use their imaginations. On the agenda this week is grocery shopping, making a meal for a friend, VBS and the first of the green beans will probably be ready. If I don't pop back on this week you will know why! My friend, Nicole, recently had her sixth child. Since then she has been sick and hospitalized several times for a non-birth related issue. Many of us at church have been stepping up preparing meals and offering childcare. The kids recently spent the day with us. Eight kids that ranged from nine to two. Things were certainly hopping around here! I didn't think to tell the kids to bring swim clothes so we used the pool like a large water table. Don't worry there was constant supervision. :) They had a blast! They all played here for a good hour. After a full morning of outside play we took a break for lunch and naps for the little ones. To keep the house quiet while the little ones settled down we watch an episode of 19 Kids and Counting and then did some puff painting. Late afternoon we were all hot so we headed back in. The older girls headed to Megan's room. The boys and Adelise stayed with me in the living room. The kids were well behaved and we had such a fun day! Sweet Adelise came back and spent two days and a night with us while mom was back to the hospital. All the kids will be joining us for a day or two this week as it looks like Nicole will be having surgery. Megan is excited for her friends to return.